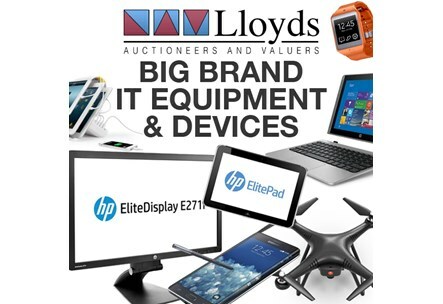 Pickup new or used cheap electronics and buy your next computer, television or IT equipment online at Lloyds Auctions. Computers, TVs and Electronics can be very costly items – particularly if you are looking for the latest and greatest and are shopping at full retail prices. But, what if you knew you could buy the latest gadgets from the ‘big brands’ for a bargain? Lloyds Auctions can hook you up. If it has a circuit board and/or a power cord you can bid on it! From a digital camera, to the latest smartwatch, to a high-tech drone, stay tuned for the best in electronic goods up for grabs – available online or onsite. Keep your eyes on our online auctions. Some of our quality lots are completely unreserved and start at just $1. Whether you’re a mad gamer and want the best platform to watch World of Warcraft or maybe you are just someone who can’t get by without regularly updating your Facebook, Lloyds Auctions regularly acquire a range of items to suit any digital demand. We have a range of computers for sale. You might be after a new laptop or tablet. Or, maybe your cat has knocked over your monitor and you need another one fast? Don’t fret. The solution is always a lot cheaper and easier than you might realise when you bid with us at Lloyds Auctions. We’ve come a long way since the 1950s when people would meet up to watch the telly at that one household in the street lucky enough to own a TV set. Today, we enjoy our broadcast transmission best when it’s in the format of big, clear and flat. If it takes up an entire wall, if you see the hairs on the end of a newsreader’s nose and it’s as flat as a tack, then you know you’re onto a winner! We have a range of TVs just perfect for watching Game of Thrones season 7, from Plasma’s to LCD, HD or 3D. And guess what? Here at Lloyds Auctions we have TVs for sale that are still in the original manufacturer packaging. This means that you can purchase practically “as new” at auction-only prices. Are you searching for an Apple iPhone 7 or a Nintendo Switch? Maybe your looking to upgrade to a better camera, like a canon 70d? Whatever your need or your hobby, you will be overwhelmed for choice when it comes to electronics for sale at Lloyds Auctions. Printers/scanners, digital video recorders, GPS equipment, CCTV cameras – if it’s a gadget – we’ve likely got it!